A talk by social anthropologist Prof. Sarover Zaidi. On 6th December 1992, national television beamed the demolition of the Babri Masjid in Ayodhya. The domes of the Babri masjid, possibly seen for the first and last time on this day, were smashed into a pile of rubble, by a Hindu mob, mobilised by the right-wing political party of India. The fall of the domes of the Babri Masjid triggered, a range of protests across the country, eventually sparking communal violence between Hindus and Muslim, the likes of which had not been seen since the partition of the country (Mufti; 2007). New regimes of thinking about the secular nation state, located in ritual discourses, practices, imageries and horizons emerged after this event (van der Veer; 1994). Riots broke out in many cities and the most intensive violence, looting and police firings were reported from the financial capital city of Bombay. The riots in Bombay started on 7th December 1992, and within a month they had set out a systematic itinerary through Muslim Mohallas of Dongri, Bhendi Bazaar, Nagpada, and Mahim, stretching out to include new Muslim settlements of Dharavi, and Govandi (Hansen; 2001). The Muslim Mohallas were now not only marked in their spatial and social horizons as problem areas, they continued afterwards, to represent distinct semiotic, architectural and ethical horizons to the city of Bombay. Mz. Zaidi's fieldwork undertaken in one such Muslim Mohalla of Bombay, explores how the construction of a flyover provided new political and bureaucratic horizons to an already stigmatised area of the city. Built nearly ten years later the JJ flyover, at the time was the longest flyover of the city, and generated both a vertical and horizontal sovereignty (Weizman; 2007) towards the neighbourhood. The start and finish of the flyover also drew a new spatial topography of difference between the colonial town, located at its south end and the native town now located under it. The contrast to the colonial city was re-calibrated through a swift bureaucratic decision classifying the Mohammad Ali road area, as the under the flyover. This whole area smells of meat, and you can see the innumerable minarets coming up here now an informant points to the modes this area has come to be received by those crossing over it. Her paper explores the manners in which such horizons  located on the spatial, political and ontological come to map the city for its citizens. She ethnographically explores this horizon, through forms of by-passing, contestation and surveillance. 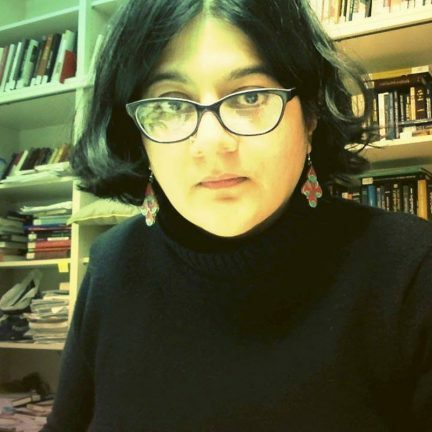 Sarover Zaidi is a social anthropologist, research scholar, writer and curator. Based out of New Delhi, she writes on architecture, design, material culture and religion. She is currently an Assistant Professor of Art and Architecture at the Jindal School of Art and Architecture, Sonipat, Haryana, India. Prof. Zaidi studied philosophy at St. Stephen's College and Sociology and Social Anthropology at the Delhi School of Economics, Delhi and at the Max Planck Institute for the Study of Religious and Ethnic Diversity, Germany. Besides this, she has lived in a Buddhist nunnery, worked on poverty, health and hunger death issues across Bihar, Jharkhand and Chhattisgarh, learnt how to center a clay pot, obsessively collected iconography and images in Islam and Hinduism, taught medical doctors the poetics and politics of life, and ran courses of social anthropology for artists, photographers architects, and monks. She runs an interdisciplinary forum 'Elementary forms and the city', which attempts to mess disciplines up from the inside. Prof. Zaidi is working on her book on religion and architecture. Read more about Prof. Zaidi HERE.